Don’t meet your heroes, isn’t that what they say? This may well be the case if you have glorified a football star and are disappointed by his slowness of wit, or you idolise an actress and are shocked by her self-centred ways. But what if you spent your childhood reading about game designers, buying Amiga Power and Super Play rather than Smash hits and Shoot magazines? What would it be like to meet the folk, who are not always fame hungry, or spot light seeking? Despite what many presume is the case with my job, I tend not to bump into celebrities often. Those that I have met have been pleasant of course, but when you are meeting them for work it all feels different and somehow inappropriate to ask for an autograph. In a work environment I’ve never got star struck, I just focus on my work. I was star stuck last night however, by a man who to me is every bit a legend. It’s seven in the evening and I’m strolling into the video game themed ‘Loading Bar’ in central London. I’m gazing around the room, hoping to meet a friend from Twitter, a hard thing to do when you only know each other by user names and don’t know what each other looks like. But cutting through my gaze strolls a man I do instantly recognise. There’s a confidence about him, he has a rock star swagger and a pony tail. He is Jon “Jops” Hare, he is Sensible Software. I’m caught off guard and any ounce of coolness I have drains from me in an instant. “Evening” he says as he casually pushes past, I mouth something but no words come out. In this situation I am not a work colleague, or someone who makes the celebrity look good – I am obviously a star stuck fan. You would think I’d have had a witty retort prepared for this very moment; I am after all in this bar to meet this very man. The occasion is the launch party for a book that I backed on Kickstarter: The History of Sensible Software. 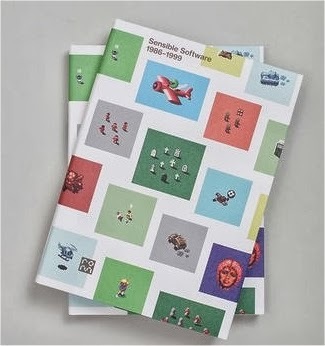 I doubt anyone reading a blog about boxed SNES Games needs an explanation as to who Sensible Software are, after-all in the nineties they were at the top of their game making classics like Sensible Soccer, Mega Lo Mania and the fantastic Cannon Fodder. Sadly though, for a company at their peak the onset of 3D graphic lead to their demise and now all these years later Sensible Software have all drifted apart. When I saw that Darren and the team at ROM were making a book that documented not just the games they made but also the back stories behind their creation I was on board straight away. Though I regularly read magazine such as Retro Gamer, I find the few pages they offer on a subject to be far to fleeting. This was to be a book that went into meticulous detail about a company that I adored growing up. In an industry that sometimes feels so guarded and restrained this honesty is refreshing, the curtain lifted on a world of game creation that remains mysterious and exciting to me. The party that I was strolling about in too seemed unconventional and open. I have tried to meet industry figures in the past of course. The Eurogamer Expo allowed me to hear Peter Molyneux chat about cubes, and Brian Horton talk about Lara Croft’s lack of hot pants.I have recounted my failed attempt to meet Hideo Kojima , but all of these events were one sided occasions where someone spoke and I listened. In this bar, on this Wednesday night I was literally rubbing shoulders with not just the charismatic Sensible Software figure head, but also Stoo Cambridge the graphic designer who perfected the classic Sensi-Aesthetic and Chris Chapman the unsung hero behind the programming of Sensible Soccer. Considering I was a wide eyed, over-eager fellow clutching Snes boxes (and a Sharpie pen for them to sign them with) they offered more warmth and time than I ever expected. Minutes were lost talking about the virtues of eyes on a nine pixel high character, or how you don’t need to be a football fanatic to enjoy a Soccer game. Each Sensible member was friendly, gracious and intelligent – perhaps just keen to talk about their creations with people who clearly adored them. The book we are here to celebrate is a must buy. Not just for anyone who liked Sensible Software in the nineties, but also for anyone with an interest in game creation in general. The publishers ROM and the author Gary Penn (a truly compelling guy to chat to) have done an incredible job, getting frank honest stories and rare unseen production images. A weighty tome filled with anecdotes and character, recalling a time when 2D sprites reign supreme and British wit still had a place in what is now a Japanese and American dominated industry. As you flick through the interview filled pages its clear how much affection and pride there is for the games. Each chapter reveals secrets and thought processes that have given me an even greater thirst to return to certain games that were such a key part of my childhood. I wonder if the people I’m chatting to will ever realise the effect they had on young lives, the memories they helped to create. Sensible Soccer was one of the few games my Dad wanted to try for example, and many nights were sat beside my brother playing WizKid trying to make sense of the abstract madness. These are special moments for me. Special moments that I can only now recall, thanks to the efforts of the men in this room. It’s fantastic that their stories of game creation are committed to paper, but the products they made are themselves the prompt for many other stories – unique to an individual but cherished just as much. In the past I’ve mentioned how I often dilute my affection for video games when talking to friends, in fear of judgement or worse still inspiring some sort of pity or boredom. At events like this, there really is no need and it’s why I enjoy the occasion so much. Some may laugh when I tell them I’m spending a rare evening away from my family in the company of strangers from Twitter and people who made a game I liked half a lifetime ago, but for me it’s the perfect evening. A chance to make new friends and meet childhood heroes. A chance to recount happy memories and create new ones. 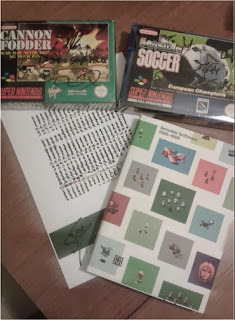 Some maybe horrified that my formally mint pristine copies of Cannon Fodder and Sensible Soccer now have names scrawled all over them, but for me the value is much greater. Now these boxes not only present a chance to playing two incredible games, but looking at them will always remind me of a time I managed not to be cool when face to face with a personal legend. I was there too, who were you Julian? Great post! And great to see you there sir! It was a truly great evening. Talking of being star struck, I recall seeing Jon Hare when I first arrived. I asked if he'd "been here long". Oops! Soon made up for it later on by speaking to him about football and the various formulas he'd devised that guaranteed his team's Premier League survival. Sensible Soccer indeed.